There are few published autobiographical writings of workers from the first half of the nineteenth century. This in itself makes Robert Pounder’s notebooks of more than local interest, though those with a special interest in the West Riding textile industry should particularly appreciate their publication. Robert Pounder (1811-1857) already has a fragment of literary immortality in that he is quoted by Frederick Engels in his ‘Condition of the Working Class in England’ of 1845. However this ‘anikdote’, is not representative of the writings in Pounder’s notebooks. Whereas it is a second hand account of a place (Manchester) of which he knew little, his notebooks are full of immediate and intimate details of his own life in Leeds. Like many autodidacts, Pounder had a magpie mind and it is reflected in the jumbled miscellany of material he recorded. His highly erratic orthography is also a reflection of someone self-taught but, for a man who was relatively literate, the idiosyncratic spelling of even familiar words like ‘America’ would suggest some degree of dyslexia. Deciphering this script must have been a difficult task and it would be pedantic to point out errors and misinterpretations that have crept in as a result. Ann Alexander, the editor, should be congratulated for her dedication in bringing Pounder’s writings to the attention of historians. Her introduction, summarising the content of the notebooks and various aspects of Pounder’s life, along with the numerous footnotes, are indispensible, although not without omissions. The notebooks record material from 1827 to 1847 and include some earlier biographical details. It is perhaps easier for the reader to start with the ‘small notebook’ first, although it is second in the volume, since it contains information about Pounder’s early life. As well as references to contemporary events, the notebooks contain recipes for medicines, poems, inventories of belongings, snippets of financial accounts, acts of charity he received, genealogical details, records of wages and teazle prices. An anthology of Pounder’s own verse fills 75 pages of the 193 pages of transcribed notebook content. As a working man poet Pounder is not in the league of Ebenezer Elliott or John Clare, but as a record of the intimate thought and ideas of someone in his station of life it is invaluable. His political and religious beliefs, his joy, his grief, his love of nature and hatred of oppression all find naive and ingenuous expression in his verse. The tantalizingly laconic references to political events and social movements can be frustrating since although Pounder’s life touched on many aspects of working class radical activity of the time, he chose not to record them in detail, at least in the surviving notebooks. That he was capable of such detailed journalism, notwithstanding his spelling problems, is clear from the two letters which Richard Oastler published in his ‘Fleet Papers’ and which are reproduced as an appendix to this volume, including the one reproduced by Engels. Pounder was a teazle handle setter, and therefore part of the cloth finishing branch of the woollen industry. For a time he worked at Oatlands Mill at Woodhouse, which, in January 1812, suffered an arson attack attributed to the Luddites. However, his writings throw little light on what it was like to be in the cloth finishing trade in the years when hand finishing finally gave way to machinery, although he does note the impact it had on some of the small, decent master manufacturers, ruined by competition. In the 1830’s he was involved in the trade union movement, but his entry for May 10 1834, when Yorkshire trade unionists were locked in an epic battle for survival with the manufacturers says only, [His spelling] ‘This day 24 mills stopt on perpes to breck up the traids uinon which thee was 3,000 men and upwords thrown out of imployment besides children and women which…’, ending mid sentence. He was also a founding member of the Commercial Order in Leeds, a venture in cooperative production linked to the Owenite trade union about which we know little, but he records nothing other than this fact. 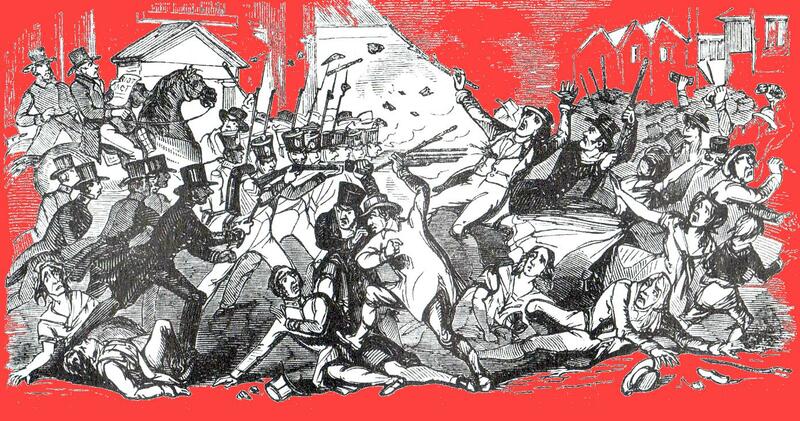 His reference to the 1842 general strike pays more attention to troop movements than the activity of the strikers. A staunch supporter of the Ten Hours Bill and opponent of the New Poor Law, Pounder was also a personal friend of Richard Oastler, (who visited his home and who referred to him as ‘Robert’ in a letter to the Northern Star), Rev G S Bull and of the leading West Riding radical and Chartist Lawrence Pitkethley, but he adds little to our knowledge about them. Similarly, although he shared a platform with the Chartist George Julian Harney, Pounder’s other involvement in the movement is unmentioned. He is also modest about his own role in the the allotment movement of which he was a leading promoter in Woodhouse. However, although Pounder may be reticent about his political activity, his record of personal suffering in the 1840s as a sick and unemployed worker, compounded by loss of his wife, are vivid and moving. In his jottings and verse he says more about the ‘Hungry 40s’ than any economist’s analysis could. Despite the disjointed and eclectic nature of this record, it is a poignant account of an ordinary working man in the industrial revolution. ← THE REVOLUTION IN ROJAVA – Documents and Debates.